This is a treat that is truly meant to be savored. I eat just one of these a day, because I am still trying to lose weight, and if I don’t have a limit I could easily eat the whole bag. These macaroons melt in your mouth with just the right amount of chocolate & coconut. They are vegan, gluten-free, non-gmo, made with raw oils and no refined sugar, and they are dehydrated at a low temperature to protect the benefits of the healthy extra virgin coconut oil. This company makes a lot of other products, and I’m looking forward to finding out if they are all this good. You can find out more about Hail Merry and where to buy them here. At 55 calories each they are a small, but very satisfying pick-me-up when you need it. Think of it as a healthy pleasure! 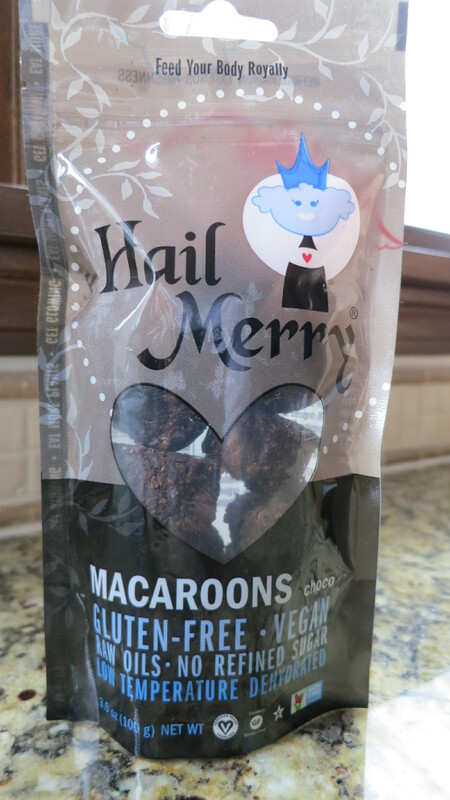 This entry was posted in Favorite Things, Food and tagged dehydrated, gluten free, hail merry macaroons choco, non-GMO, snack, vegan. Bookmark the permalink.